Over the past decade Portable Array Speaker Systems have become extremely popular with singers, musicians, DJs and entertainers. They are easy to transport, but also offer a high level of audio fidelity. However many of these systems are very expensive and also lack the versatility required by gigging performers. That’s why American Audio is introducing the STK-106W, an affordable package that offers impressive sound quality alongside an incredibly flexible feature set, making it the ultimate Portable Array Speaker System. 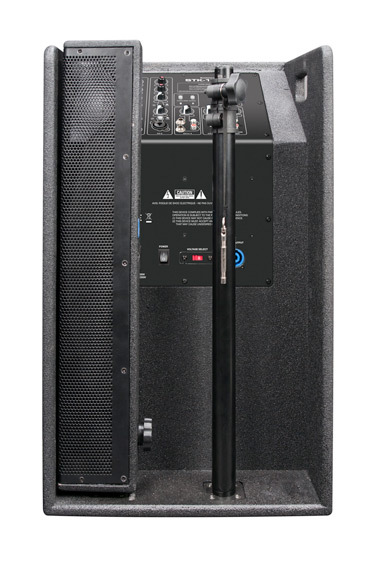 The STK-106W is a powerful 2-way PA system that combines a 10-inch woofer base with an adjustable poled-mounted 6 x 2-inch driver satellite array. Powered by internal Class D 500 + 250 watt power amplifiers, the setup generates dynamic high and low frequency sounds making it ideal for the amplification of both live and pre-recorded music. 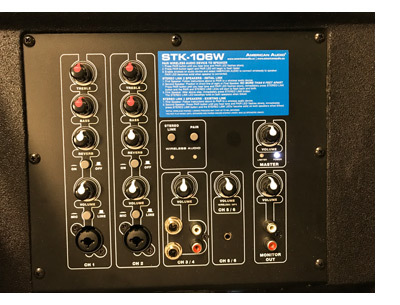 The mixer section features two mono input channels, which each have combination XLR / ¼” jack input sockets that can be switched between Mic and Line level. In addition, there are two stereo input channels, one offering a choice of ¼” jack and RCA inputs and the other fitted with a mini-stereo input jack for direct connection of an MP3 player. Each channel has a dedicated level control, while the two mono channels also feature independent Bass, Treble and Reverb controls. With a solid plywood housing and discrete textured black finish, the STK-106W is designed for a life on the road. Its base unit is fitted with two convenient carrying handles and, with a total weight of just 45.2 lb. / 20.5 kg, it is easy to carry and transport. It also features a recessed back section in which the satellite and mounting pole can be securely stored during transit, while the included padded transport cover will help to protect the whole system from scratches and scrapes while it is being moved between events. With an unbeatable combination of audio quality, flexibility, portability and affordability, the STK-106W really is the ultimate Portable Array Speaker System. If you need a powerful, versatile and easily transportable speaker system for live performances or DJ sets, we’re sure that you’ll be impressed with this system… especially when you hear the price! The STK-106W is available now from American Audio USA.